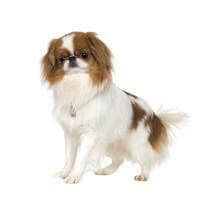 One of life's mysteries is why the Japanese Chin is still comparatively rare and unknown. Here is a little dog that has it all - it is easy to care for, lovely to look at, and has even had Royal patronage - Queen Alexandra owned 261 of them! The Japanese Chin is one of the most ancient of breeds and its exact history is difficult to determine, but ancestors can be traced back to China or Korea more than 1100 years ago. In Japan there were two distinct size/types of Chins and they were bred separately and exclusively for centuries in noble households, and were so highly regarded that no ‘commoner’ could possess one. Japanese Chins can live up to 12 - 14 years of age. The Japanese Chin is an intelligent, happy, lively little dog with a good nature and gentle temperament. While they are content to sit quietly on your lap or curled up in a chair, they are also ready for a game, and love to race around madly. Chins are happiest in the company of other Chins. Indeed a large number can live together in harmony and so if it is possible, have two! Japanese Chins, with their silky coats, are easy to keep well groomed, and brushing two to three times a week with a bristle brush and paying attention to behind the ears where matting can occur - and a regular bath - is all that is required for the coat. This will also help with the seasonal shedding. Because of the Chin's flat face, the eyes are vulnerable, so should an injury occur, seek vet advice immediately. As with any pet, ears and teeth need to be checked/cleaned regularly. A Chin does not need a huge area for exercise, so it makes an ideal pet for flat dwellers. However, they do enjoy a good walk, or better still a free run. Japanese Chins are indoor dogs and bred only to be companions. A dog kept continually outside will be miserable. It will also be most unhappy if left alone for any length of time, so if the family/owner is out all day, then a Chin is not for you. It should be said too that a Chin exercises a certain amount of independence, and being sensitive will react badly to harsh discipline, so if you want a dog to dominate, then again, this is not the breed for you. Japanese Chins do not like teasing or very rough play, and are therefore best suited to the older person or families where there are no young children.